Have you seen these teal ribbons in Downtown Ridgefield? 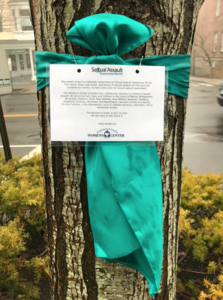 April is Sexual Assault Awareness Month, and as teal is the color for sexual assault awareness, the Women's Center of Greater Danbury has placed these ribbons on Main Street trees to raise public awareness about sexual assault and educate communities and individuals on how to prevent sexual violence. The Women's Center of Greater Danbury provides free, confidential services to ALL victims of sexual assault, along with victims of domestic violence. This critically needed service includes 13-towns: Bethel, Bridgewater, Brookfield, Danbury, Kent, New Fairfield, New Milford, Newtown, Redding, Ridgefield, Roxbury, Sherman, and Washington. Their free and confidential services are available 24 hours a day, 7 days a week, 365 days a year. The Center's other areas of focus include emergency shelter and support services, counseling and advocacy, crisis intervention, and community education, primary prevention and training. The Women's Center's Domestic Violence Hotline is available at (203) 731-5206 and their Sexual Assault Hotline can be reached at (203) 731-5204. Or for more information, please visit their website: http://wcogd.org/.